FIGURE 5-11 Linear sequence of human ACTH. Arrows point to hydrolytic cleavage and residual activity is denoted in boxes as a percentage of activity of the native structure after cleavage at a specific linkage. a-MSH comprises the first 13 amino acid sequence from the N-terminus. fi-Cell tropin has the same sequence as ACTH22-39. Immunological specificity is conferred by sequence 25-33, and the invariable C-terminal sequence is 34-39. CLIP: corticotropin-like intermediary peptide. These data are a summary from a number of different literature sources. rect precursor of the ancestral gene for both PRL and GH. The human GH gene family contains GH and four placental genes: GH variant and CSA, CSB, and CSL. PRL is a single human gene. The situation of PRL-like genes in the rodent is very complex, and since this complexity is not reflected in the human, the rodent picture will not be discussed. High-molecular-weight forms of CS protein exist in the human and may be explained by the formation of heterodimers of CS and a2-macroglobulin. So far, there is no evidence for the existence of PRL in such forms. 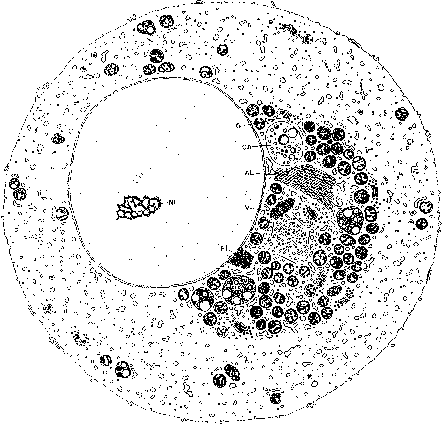 Because a subset of lactrotrophs secretes both PRL and GH, it appears that the common transcription factor activating both genes may be Pit-1. Two similar sequences of the GH and the PRL promoters contain the AT-rich moiety A(T / A)(T / A)TATNCAT. Details of the human prolactin gene and processing to mRNA and protein, as well as the promoter region of the rat PRL gene, are shown in Figure 5-16A. The most obvious role of prolactin is in the differentiation of the mammary gland cells and as a signal in the differentiated cells to produce milk proteins and other constituents. Prolactin may act like a secondary growth hormone, particularly on the liver. PRL also can act on the testis to stimulate the production of testosterone. It seems to have some role in stress adaptation as its release from the anterior pituitary is signaled by the release of /3-endorphin in response to stress and as a consequence of the action of CRH; (3-endorphin then acts, apparently directly, on the mam-motrope (lactotrope) to stimulate the release of PRL. It has been known for some time that nursing an infant on demand over a long period of time creates a period in which pregnancy rarely occurs. This is apparently the result of frequent release of PRL from the anterior pituitary in response to suckling, which may have the effect of reducing GnRH release from the hypothalamus. 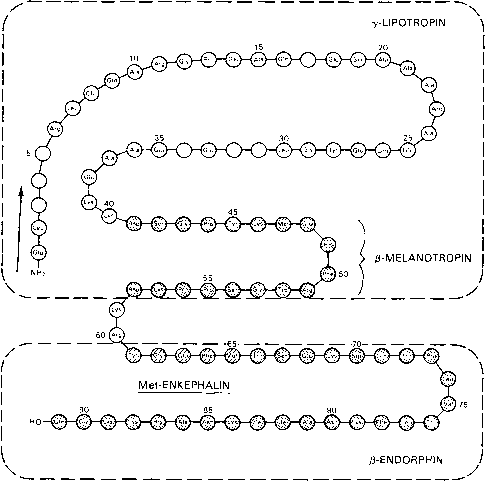 FIGURE 5-12 Structural relationship of -y-LPH, /3-MSH, Met-enkephalin, and /3-endorphin to the ovine /3-LPH structure. Reproduced from Li, C. H. (1982). "Biochemical Actions of Hormones" (G. Litwack, ed. ), Vol. 9, pp. 1-41. Academic Press, NY. function is required for the elaboration of GH (and PRL), and presumably this will have significance for human dwarfism. Estrogen is known to stimulate the production of PRL. It is likely that the estrogen receptor interacts with Pit-1 since cotransfection of estrogen receptor and Pit-1 results in the stimulation of PRL transcription, whereas transfection of the estrogen receptor alone, in an estrogen receptor-deficient cell line, does not enhance PRL expression. Glucocorticoids, on the other hand, negatively affect the PRL promoter. There is a discussion of the regulation of PRL release in Chapter 14. Significant positive regulators include estrogen, VIP, and TRH, and the negative regulator is dopamine. A summary of the signal transduction processes for these effectors is shown in Figure 5-17.